Certification of the MC-21, Russia’s advanced narrow-body aircraft project, has been postponed again, with the debut of the first variant of the airliner, powered by Pratt & Whitney PW1400G engines, now scheduled for 2020, says Alexander Rubtsov, president of manufacturer Sukhoi Civil Aircraft company (SCAC), in an interview published by Rossiyskaya Gazeta, the Russian government’s official daily news source. The aircraft’s service entry date was previously set for 2019. In the meantime, Russia’s Industry and Trade Ministry has revealed some new details on the test programme of the aircraft. 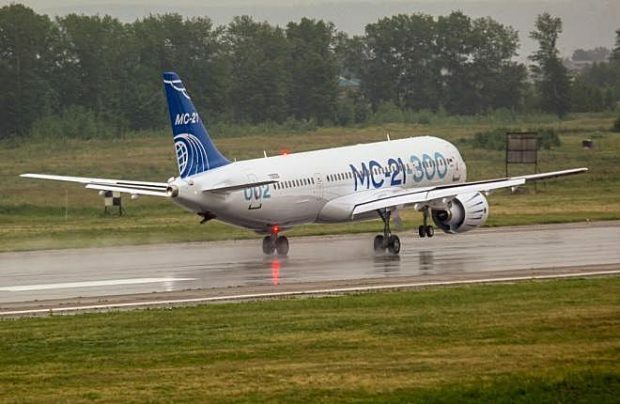 The third flight test prototype of the MC-21 is to join the testing programme next spring, whilst the fourth will be ready by mid-2019, Oleg Bocharov, Russia’s deputy minister for industry and trade has revealed. “The second prototype has commenced test flights. The third will join in March 2019, and the fourth by the middle of next year,” he explains. “The flight test programme is going as planned and we don’t see any problems. We are hoping to confirm the economic efficiency of the composite wing in combination with the new [Russian-made] engine variant,” Bocharov adds, referring to the PD-14 engine, which received certification from the Russian aviation authorities in October. Earlier plans, first revealed in late 2016 by the then vice-prime minister Dmitry Rogozin, called for the United Engine Corporation’s (UEC) turbofan to power the fourth prototype. UEC has confirmed it is ready to supply the engines to Irkut before the end of 2018. However, Bocharov admits: “There are still some questions regarding the engine’s economy. But we will continue fine-tuning it. These are normal tolerable limits, acceptable for us within the technical requirements and targets,” the deputy minister has assured. The MC-21 – powered by Pratt&Whitney’s PW1400G geared turbofan engine – first entered the flight-testing programme in May 2017, with the second prototype joining one year later. Along with building the prototypes, Irkutsk Aviation Plant is also currently assembling the fuselage for the first serial aircraft. The airframer has vouched that the cost of the new narrow-body aircraft will be lower than its western-built rivals. The current backlog includes firm orders for 175 aircraft, of which 50 will join the fleet of Russia’s flagship carrier Aeroflot. The first deliveries are scheduled to start in the first quarter of 2020.